To Arena on the "Ships starting with A" page. Received from Helmer Henriksen, whose father served on Arena (as well as Kirsten B, Norfjell, Kaia Knudsen, Norholm and Tarn, as 2nd mate/radio operator). He says the picture was probably taken at the end of 1938, approaching Havana, and was used as a Christmas card to send home to family. His father's brother, Alf. G. Henriksen took part in the well known escape of Lidvard. (Owned by A/S Alida, controlled by Markus Chr. Stray, and managed by R. K. Olsen). Built in Gothenburg, Sweden in 1927. Previous name Svolder. 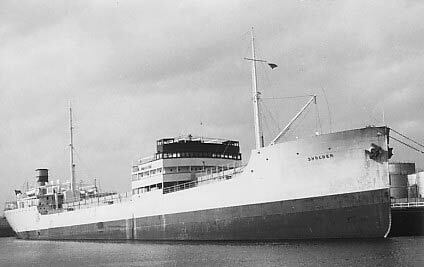 According to the external page that I've linked to above, she was delivered in Nov.-1927 as Svolder to Waages Tankrederi A/S (R. Waage & J. Stenersen), Oslo. Managed from Nov.-1936 by J. Stenersen, Oslo (same owners), no name change. From Oct.-1937, A/S Alida (Rudolf Kure Olsen), Kristiansand S., same name. Renamed Arena in July-1939. Captain: Johan Martin Flak (died in an accident in Brooklyn, March-1943), later Vilh. K. Pallesen. Guestbook message - From someone who served ont this ship in 1948, Thomas Smith. Dispersed in 10 05N 40E, Febr. 3. Traded in Indian Ocean to Oct. 9-1941. (Stop at Guantanamo not mentioned, Page 2). Note long passage - ? coasting? Then traded Malta/Sicily to Oct. 24-1944. (Via Kirkwall - Page 5). (left Dec. 28 - Page 5). According to Page 1 of the archive documents, Arena was on her way from Suez to Aden when war broke out in Norway on Apr. 9-1940. Her 1941 voyages also start on this document. She transported, among other things, fresh water to dried out places, especially Malta and Gibraltar. Sailed without mishaps through the war, except for occasional trouble with the motors (and apart from the collision in March-1945). As motors on ships were still not universally common in those days, the biggest problem was finding parts, or someone who had the right knowledge and skill to repair them if they malfunctioned. Very often the crew members, with the help of the skillful engineers on board, managed to repair or recreate the broken parts themselves, by using ingenious ideas, tools and methods, so that unnecessary delays could be avoided. In cases where these methods failed, a Norwegian engineer, Sigurd Golten, was often contacted. He started making some of the vital parts, which the crew could not make on board, and which could not be found elsewhere, in a basement in Brooklyn. His foresight was the basis for a worldwide company which still exists today; I came across it just by chance on the Internet, see the external link provided below. It'll be noticed, when gong to the various archive documents, that she occasionally had long stays in port. As mentioned in her Voyage Record, Arena sailed in Convoy KMS 41, which departed Gibraltar on Febr. 17-1944 and had Port Said as its final destination. Arena, however, was bound for Augusta, where she arrived on Febr. 23. This convoy will be added to an individual page in my Convoys section in due course, along with further info on it; in the meantime, see the section naming ships in all KMS convoys. I have a snippet of information saying that Arena was in Malta on July 29-1944, and in Augusta the following month, departing the latter for Malta on Aug. 10. Some of this agrees with the info in her Voyage Record, but the departure Augusta for Malta on Aug. 10 is not mentioned. This voyage is, however, mentioned on Page 4 of the archive documents, though departure date is given as Aug. 12 with arrival Malta on the 13th. This external page states she was owned by Skibs A/S Alida (H. Angel Olsen & Co.), Harstad from 1953, still as Arena. Sold the the U.K. for breaking up in 1955. Back to Arena on the "Ships starting with A" page. An earlier Arena: Norway lost a steamship by this name to WW I, 1042 gt, built 1883 for English owners. Had the name Radyr 1897-1907, became Norwegian Arena for L. B. Rafen, Holmestrand in 1907. Shelled and sunk by the German U-70 in the North Sea on Apr. 2-1916, voyage Fredrikstad-Hull, owned by A/S Rudolf Olsen & Ugelstad at the time. The text on this page was compiled with the help of: "Skip of menn", Birger Dannevik, "Nortraships flåte", J. R. Hegland, and misc.